Dimensions 0.22 by 5.50 by 8.50 in. 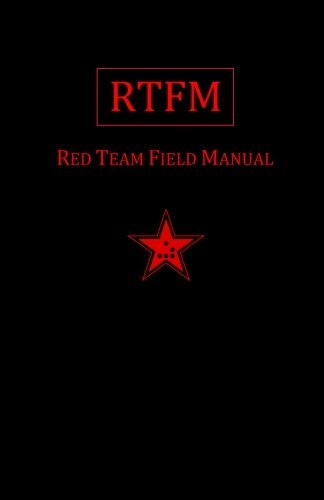 Amazon.com description: Product Description: The Red Team Field Manual (RTFM) is a no fluff, but thorough reference guide for serious Red Team members who routinely find themselves on a mission without Google or the time to scan through a man page. The RTFM contains the basic syntax for commonly used Linux and Windows command line tools, but it also encapsulates unique use cases for powerful tools such as Python and Windows PowerShell. The RTFM will repeatedly save you time looking up the hard to remember Windows nuances such as Windows wmic and dsquery command line tools, key registry values, scheduled tasks syntax, startup locations and Windows scripting. More importantly, it should teach you some new red team techniques.